Lots of family singing acts have come and gone through the years — some more successful and with greater longevity than others, like the Jacksons, the Osmonds or even the Carpenters. 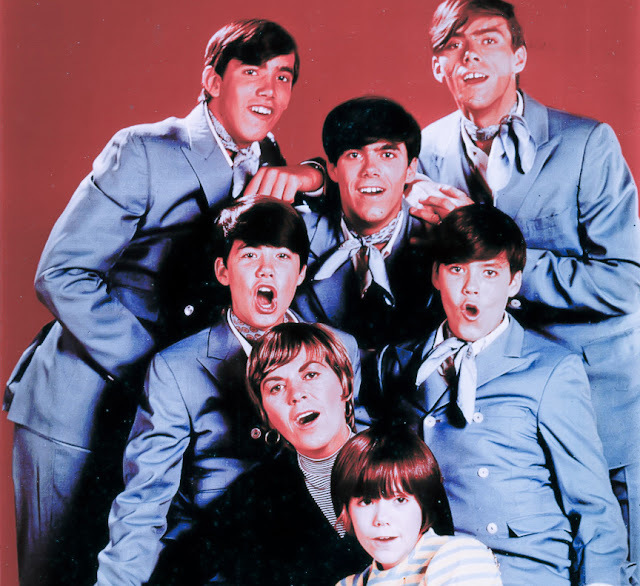 But there's one group of singing brothers and sisters that really didn't get the recognition they deserved — The Cowsills. You may not even know their name but you probably know their hits "The Rain, The Park & Other Things," "Hair" and "Indian Lake." The bad had a few incarnations beginning with the four brothers Bill, Bob, Barry and John. Soon mom Barbara and sis Susan brother Paul joined the act. Does this sound at all familiar? That's because their other claim to fame was that they were the inspiration for the TV hit, The Partridge Family. Although they were considered for the show themselves, the producers decided they needed to hire real actors. Despite a few big years in the spotlight, The Cowsills quickly faded into oblivion. Until now. Louise Palanker, a longtime fan of the band, has spent the last eight years trying to uncover exactly what happened to The Cowsills. Her documentary Family Band: The Cowsills Story is airing this month on Showtime. We spoke with Louise about why she wanted to make the film and some of the shocking discoveries she made. One night Louise went to a small pub to see Bob Cowsill perform and it coincidentally was the night John Cowsill was marrying Vicki Peterson from the Bangles, so the whole family was in the house. Louise's memories of her favorite childhood band came flooding back and she began wondering why they didn't remain famous and successful throughout their adult life. She recalled, "When the Cowsills came out, they were ahead of the Osmonds, they were ahead of The Jacksons and to me, they were the best. They were playing their own instruments, all those harmonies, writing their own songs. To me by far and away this is the most talented family and then they just disappeared." So she needed to find out why. She approached Bob about a documentary. Louise said, "He was very reluctant, but he never actually said no." So she went back to see him play again and pushed a little harder. Bob told her the story, "was too big, too complicated and it can't be done." She finally convinced him it can be done. And she did it. The first shoot was in 2005 at Fenway Park in Boston, where The Cowsills were invited to sing The National Anthem before a game. The family agreed to let Louise tag along and film the performance. What she witnessed was a family with a lot of tension and a lot of demons and over the next few years she would burst open the floodgates. They began shooting but just a few months later tragedy struck in the form of Hurricane Katrina. Both Susan and Barry were living in New Orleans at the time. Susan and her family made it out of town, but Barry lost his life in the tragedy. And as is that weren't enough, the night the family was gathered for his memorial service, and Louise was filming, the word came to them that brother Billy has also passed from complications of emphysema. Louise described the moment the family learned the news, "It was so shocking and devastating. When you look at it, you saw they were all together as a family, they can be together. And you're thinking, do I film? Do I not film?" Ultimately she said, "We stopped filming for two years. Nobody wanted to do it any more." She gave the family their space and eventually Bob called and said, "Let's have lunch." He told her that day that his siblings wanted the movie finished. Louise finally got her chance to tell the world why The Cowsills didn't translate into adult stars. What she uncovered was that behind those cheery songs about swimming in lakes and loving flower girls was a sad group of abused kids. And because of that rough childhood, they didn't have the capacity to translate their success into adulthood. She stated, "Why weren't people this talented given as children all the ingredients and the fuel that you need to be powerful, successful adults with life skills? They weren't given any of that. It was robbed from them." It was stolen from them by their abusive, controlling alcoholic father who also acted as the band's manager. She added, "When the teen idol fame ended, they didn't have the tools they need to regroup. They just scattered…. They had to figure out how to raise a family and how to be a good human being. They had to figure that out on their own." From everything she uncovered during her time with the family she was most surprised to learn what good parents they all turned out to be. "When you found out what their dad had done to them and you saw what good parents they all were… that's not supposed to be the pattern is it. They're all heroic in that way… There's so much love there. I didn't think I was going to see that when I was beginning to find out about what had happened." And as for The Partridge Family, Louise remembers as a kid reading that The Cowsills were getting their own TV show, so when David Cassidy and Shirley Jones showed up, she was a little disappointed. After all these were just actors. And Tracy couldn't even play the tambourine on the beat. She did love the show and the songs, but she couldn't help but wish The Cowsills had gotten that break. She stated, "You felt gipped if you were a Cowsills fan." You won't feel gipped watching Louise's movie. Although word of warning, it's not as upbeat and happy a their music once was. But it's a great trip down memory lane and a powerfully dramatic, gut wrenching tale. Family Band: The Cowsills Story is airing this month on Showtime. Check local listing for dates and times.